Top Rx Pharmacy (Top-rx-pharmacy.com) is an online drugstore now closed. The web does not have reports for its closure but it can be confirmed that the store is now shut down—if you visit Top Rx Pharmacy, you’ll be greeted by a generic error message instead of being ushered to the store proper. The store had records on the Wayback Machine since 2011, although the data present on the archives were broken and there were no images saved for the shop. However, I am still thankful for the data available for the shop, since not all closed shops have saved information from archive websites. The products available on Top Rx Pharmacy included meds commonly found on every online drugstore. As the usual with online drugstores, the shop listed its medications by their medical conditions treated. 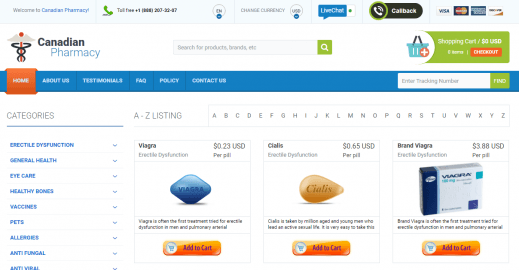 Top Rx Pharmacy’s online archived records showcased that the erectile dysfunction treatment products were the ones taking center stage, although the store also had products for infections, mental health issues, bone health, pain relief, and other chronic and general health concerns. The shop offered its generic prescription and non-prescription products without asking the consumers for valid Rx notes from their doctors. This is illegal practice, but online shops continue to do so anyway. I observed that the generic items on the store were mostly from illustrious India-based manufacturers, although some of the products on Top-rx-pharmacy.com were also unbranded. The cheapest drug offers by Top Rx Pharmacy was for its no-brand meds, which to me were disconcerting—products with unknown brands are always linked to various health concerns and may be detrimental to the patients’ health. 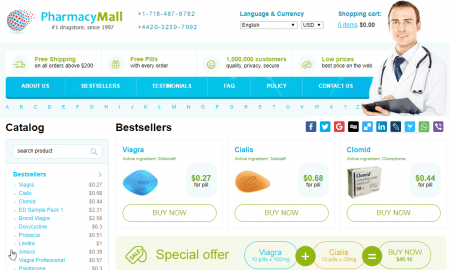 As for the prices for the meds, Top-rx-pharmacy.com offered the Generic Viagra 100 mg product for $59 (10 plus 2 pills) and the Generic Cialis 20 mg for $74 (10 plus 4 pills). I wondered why the shop had such prices for the meds while the other online drugstores offer the same meds for about $30 to $40 less—I discovered that the store included the shipping fees to its product prices, hence the price. Although Top Rx Pharmacy offered free shipping for all its products, it still charged more than the other online shops with no free shipping for their products. However, Top-rx-pharmacy.com claimed to have no additional or hidden fees for the consumers—which I was unable to verify due to its offline status. Payments honored by Top Rx Pharmacy only included the usual MasterCard and VISA credit cards. The store replaced orders seized by customs or encountered any problems when it came to delivery. Top Rx Pharmacy had its own live chat support option, but since the shop is now offline, the store could not be reached using its chat support. No consumer reviews were available for Top Rx Pharmacy from common sites such as review websites and forum websites. The store does not have mentions from its former clients, which indicates distrust from consumers. 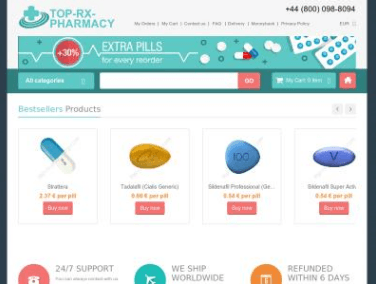 Good online stores are usually accompanied with positive reviews from its former clients, but unfortunately, the shop Top-rx-pharmacy.com did not have reliable reviews for its service even during its previous years of operations. According to the Scam Adviser result for Top Rx Pharmacy, the online drugstore only has a low trust rating (1/100) and the age identified for Top Rx Pharmacy was only 1 year and several days. The shop was identified in the United States and Scam Adviser was also detected as an offline store. The same low trust rating was given to Top Rx Pharmacy by Scamner—the store was only given a 3% out of 100 because the store did not have its own SSL certificate, which compromises the buyers’ safety on Top-rx-pharmacy.com. Aside from having a low trust rating, the store was also identified to have very few visitors. The age identified for Top-rx-pharmacy.com though was 2 years, but according to Scamner, the domain expired a year ago. Like Scam Adviser, Top Rx Pharmacy was also identified in the United States. Although Top Rx Pharmacy did not have coupon codes, the store advertises that it offered all of its consumers free shipping. According to Top-rx-pharmacy.com, its free shipping has no additional fees, so the buyers should only expect the same checkout amount on their final bill. Freebies, on the other hand, were not offered by Top Rx Pharmacy for its clients. No other discount deals existed on Top-rx-pharmacy.com despite its high product prices. Top Rx Pharmacy operated only briefly—the store had the same products available, and the shop also had free shipping for its consumers. However, the store still had higher prices for its products than the other online pharmacies charging minimal shipping fees for their consumers. Even if the store is online today, I wouldn’t recommend purchasing from the store due to its prices higher than normally charged by online pharmacies. My rating for the closed shop is 1 out of 5.